It’s undeniable that freestyle skiing and snowboarding is on the rise. Though the legendary X Games and various World Cups and Championships have existed for a long time, the addition of ski and snowboard slopestyle to the Winter Olympic Games in 2014, Snowboard Big Air in 2018 and Ski Big Air in consideration for 2022 has made freestyle snow sports increasingly visible on the global stage. But how exactly can you get into freestyle skiing and snowboarding in the UK? Britain has a lot to offer when it comes to freestyle. From the established talent of the GB Park & Pipe Squad (think Billy Morgan’s incredible bronze medal at the PyeongChang Winter Games) to the exciting young potential on display at the BRITS, there has never been a better time to get into freestyle skiing in the UK. So whether you want to give it a go yourself or you’ve got children determined to be the next medal-winning Brit, let us take you through the best ways to get involved. For anyone wanting to advance their skiing (freestyle or not), the key piece of advice that you will hear most often is to head to your local ski slope. There are a huge number of these across the UK – you’re never far from one, and recent technology has meant that these slopes and snowdomes are more useful than ever. Many ski slopes also hold dedicated freestyle sessions, whether on a weekday evening or at the weekend, to give budding freestyle fans (young and old!) a chance to come and try their hand at some small kickers, rails and boxes. Often the freestyle setups get changed to ensure that there is enough variety for those who come week on week. For example, The Snow Centre at Hemel Hempstead has freestyle opportunities on Tuesday, Thursday and Friday evenings. Thursday is the main night for freestyle here as the park takes over half of the main slope with a vast amount of opportunity for all abilities. As if this wasn’t enough, throughout summer there are beginner park sessions on the first weekend of every month as well as additional features every Thursday evening and Friday Freestyle events on the last weekend of each month! Tamlands Freestyle sessions run every Tuesday and are perfect for beginners and younger freestyle fans, with more gentle setups and coaching from 7pm. Then, on the last Tuesday of every month, the setups get more progressive at Tamlands’ ‘laboratory nights’. With more experimental park setups, these evenings are ideal for more progressive, experienced riders who want to develop their skills further. 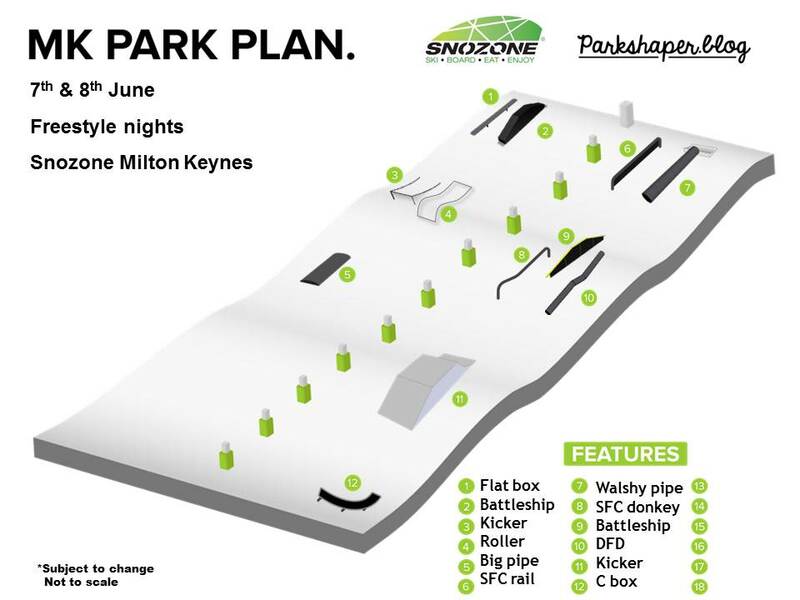 Meanwhile, at their Milton Keynes and Castleford locations, Snozone offer Thursday and Friday night freestyle sessions and coaching on their specially designed freestyle parks. To really make the snow though, why not take on one of their freestyle skiing day courses for those of 16 years and over. A full day course (8 hours!) this is the perfect place to begin your freestyle journey with introductions to boxers and kickers, giving you the opportunity to learn 180 grabs and flat land freestyle skills. If you can’t get to a snowdome, dry ski slopes such as Snowtrax often hold regular freestyle events and competitions like the Air Attack Freestyle Comp – perfect for those looking to put their new skills into action! Take a look at our UK Skiing Guide to find the closest ski slope to you as well as opening times and facility details! There are a huge amount of YouTube channels and websites out there that are chock full of tuition tips to help you master those tricks. Whether you’re watching on your phone on the gondola up or making sure you’ve got the theory memorised before even heading to the mountains, it can be really helpful to see and hear tips from the people that have mastered these tricks. Stomp It Tutorials are undoubtedly one of the most popular channels for this, with free video tutorials uploaded onto YouTube throughout the winter, as well as more in depth paid-for tutorials available on their website www.stompittutorials.com. Started by Swedish freestyle skier and coach Jens Nyström, Stomp It Tutorials aim to teach fellow skiers the tricks they have previously only dreamed of stomping in a safe and simple way. From beginner tutorials to more advanced tricks and even powder skiing tuition, you’ll find more than enough free tutorials to keep you entertained for a long while, but if you really want to advance your skills with more in-depth tuition, their premium video package is available for $49. A testament to their easy to follow, entertaining content, Stomp It Tutorials now have almost 80,000 subscribers on YouTube and have recently announced the creation of their first ever freestyle ski summer camp in Les 2 Alpes. Ski Addiction are another popular freestyle tutorial YouTube channel, producing videos throughout the year that demonstrate how to learn various tricks and grabs both on snow and on trampoline practice areas using their unique ‘tramp skis’. The Futures Project is an initiative that looks to support and encourage young people across the UK to get involved in freestyle snow sports in a fun and progressive way. A collaboration between British Ski & Snowboard, Snowsport England, Snowsport Scotland and Snowsport Wales, it aims to bring top tier coaching as well as a huge amount of fun to British slopes. Aimed at young people between 6 and 18, the Futures Project comprises of two parts; Futures Snow Awards and Futures Sessions. Futures Snow Awards are aimed at those aged 6 – 12 and supports entry level engagement in snow sports and introducing a self-driven, skills-based approach to learning. Each ‘step’ of the award is made up of 20 tricks – 10 ‘on snow’ tricks (which can also be achieved on indoor or dry slopes) and 10 ‘off snow’ tricks. Once all 20 tricks have been perfected, the next ‘step’ will be unlocked, with the steps becoming progressively more challenging. The best way to start out on the Snow Awards is to attend an official ‘Futures Snow Award’ event, where groups will benefit from a qualified instructor taking them through all 20 tricks. You can also download the steps online if you sign up to Futures (which is completely free!). For older skiers, there are Futures Sessions. These are coached freestyle days for those aged 10 and over, which act as an entry point into the GB Park and Pipe performance pathway. These sessions are either on snow or at a dry slope and offer a great way to get involved in Park & Pipe. With qualified coaches providing tuition and the odd Olympian coming down to lend a hand, it’s the perfect place to learn and practice new skills. If you can’t wait until next winter, Europe’s largest glacier at Les 2 Alpes provides the stage for a number of summer freeski camps (including that of Stomp It Tutorials). At an altitude of 3200 metres, the snow park here has a number of kicker and rail lines for all abilities of skier and snowboarder, as well as a half pipe and a super pipe. It’s the perfect playground for freestyle fans and as a result it’s unsurprising that many camps choose Les 2 Alpes as their summer base. Camps such as Parom Camps operate here through June and July and offer both beginner and advanced (over 18) camps. Alternatively, Parom’s pre-season October freestyle camps can be found at Austria’s snow-sure Hintertux and Stubai glaciers for those that want to brush up before the season kicks in. 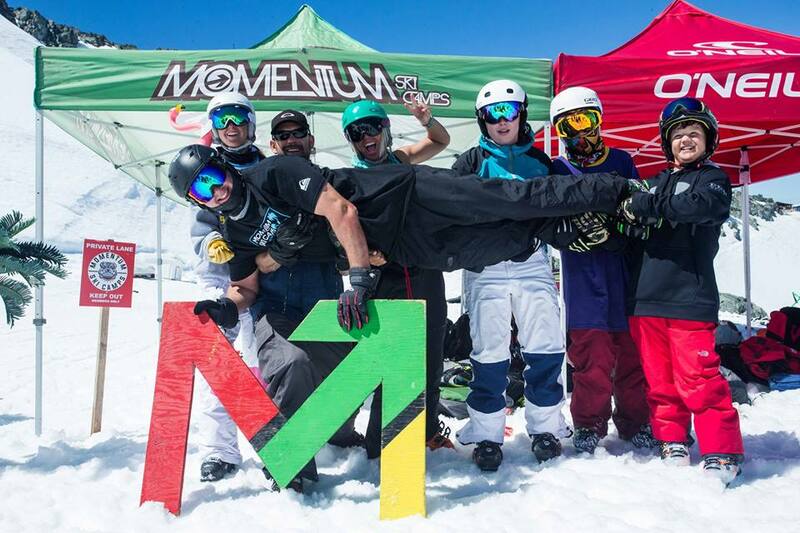 Heading further afield, The world-famous Momentum Ski Camps in Whistler have a reputation for cultivating some of the world’s most famous freestyle names. Utilising some of the best summer skiing terrain in North America, an exceptional freestyle coaching team and fun après-ski activities, it’s a summer experience that many can only dream of. Bringing a taste of good old Blighty to the mountains this summer, British Freeski Camps are offering two camps with expert tuition from the top British riders. Their camps are based in Cervinia, Italy and take place in August. 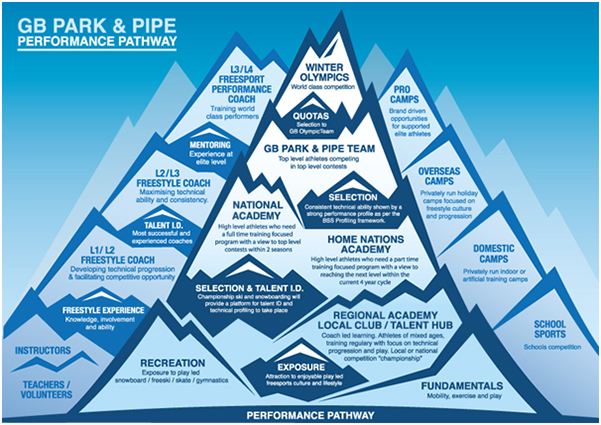 This pathway takes in all the levels of selection within the Home Nations and British Ski and Snowboard and is designed to guide selected athletes to train and to potentially compete in freestyle ski and snowboard events. The Home Nations Academy: Those who are identified as having the talent or potential to progress through the performance pathway can be selected to the Home Nations Academy – you must have sent in an application demonstrating that you meet the criteria with video evidence. GB Development Team: A step up from the Home Nations Academy, those at this level will have trained and competed in a mountain environment. These are the athletes that show potential to progress into the GB Park and Pipe Squad, which requires much higher levels of commitment to training and development. GB Park and Pipe Main Team: The main squad from which athletes are selected to compete in World Cup, World Championship and Olympic events. Those in this squad are full time athletes. GB Park and Pipe – What is the Futures Project?